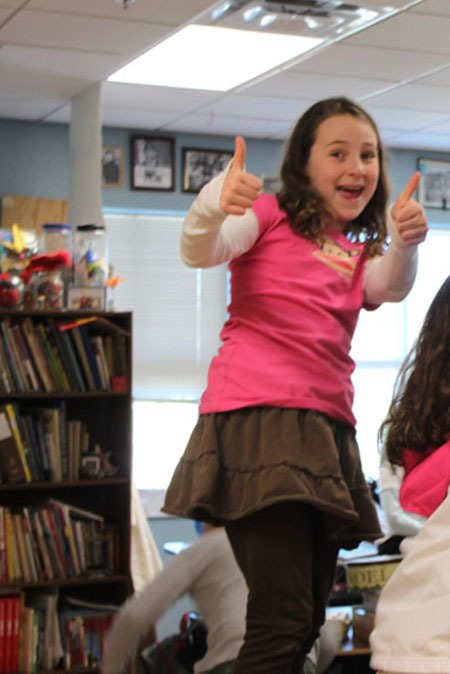 Fuzz’s class had their Valentine’s bash today and boy do they know how to throw a party. Along with eating healthy and unhealthy treats brought in my parents, they exchanged Valentines and played a game of Valentine’s Day family feud. I haven’t volunteered much this year, but was glad to be part of the action. Oh, and not just because I wanted to use my new Cupcake Courier. Really, not that. I saw this at Costco before the holidays and resisted the temptation to throw it in the basket since I wasn’t sure I’d use it enough to justify the $17.50. A few weeks later, after volunteering to bring cupcakes to the Valentine’s Day party, I changed my tune and went to Costco specifically for the courier. Now I’m glad I did because a) I had a lot of fun filling it up with cupcakes and b) it’s so sturdy I was able to carry 36 cupcakes in one hand and another box of junk in the other. My only complaint about the product was they put a big sticker on the front and side and it took me a decade to scrape it all off. They should either sell these without the sticker or include a free bottle of Goo Gone. If you live in Austin, Costco has the couriers set up by the front door. I’m not sure how long they’ll be there, but if you don’t find them at Costco, Amazon has them for about $35.00. Owning one will make you want to bake cupcakes ALL THE TIME. 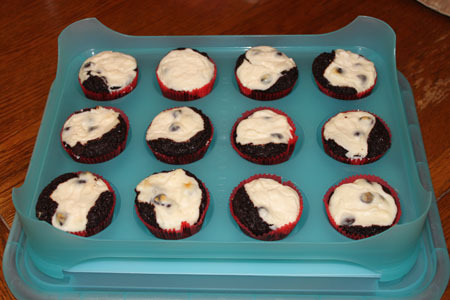 By the way, along with red velvet cupcakes I made these black bottom chocolate cheesecake cups. I was in fourth grade when I first tried these, so it was fun introducing them to the kids. I have that carrier and use it a lot! I love it but my other complaint about it is that the cups are too deep. Makes it hard to get finished cupcakes out without screwing up the frosting. Great video from Fuzz…keep up the good work! I always use a blowdryer to remove pesky labels. The heat loosens the sticky side and helps it peel right off! WD-40 is a cheap & effective product for removing that pesky goo from labels. oh how i’ve been wanting one of these! It’s been on my Amazon wish list forever now! I suppose i’ll have to splurge and buy it for myself! I have four of them! Love them. You can also put a piece of styrofoam on the bottom and they are tall enough to carry cake pops. 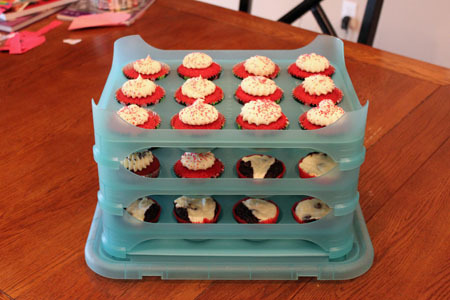 I have a bunch of cupcake carriers, but not this one! This is a new one to me, I like it! 36 cupcakes in one carrier is impressive. I could really use that! And a cake one too! I got one of these couriers years ago when they were hard to come by and much more expensive than at Costco. Even still, it’s been a great purchase. LOVE it! I actually do need one of those. but we don’t have costco here. i never seen them. cute pic of fuzz! The last time I saw these in Costco I tossed one in the basket and it’s sitting in the corner of my guest room right now. I have no idea if/when I’ll ever use it, but I like the idea that I have one and it’s super cute on top of that (I got the blue one, too…the white one wasn’t nearly as fun). And I totally want to make those black bottom cheesecake cups now! They look delicious. I love that cupcake carrier! It took me awhile to buy a cupcake holder because it seemed like such a one trick pony and one that would take up too much valuable room in my small apartment. However, I went with one that also doubles as a cake carrier and, believe me, when I have to transport cupcakes, nothing does the job better. Do you know the peanut butter trick to remove sticker adhesive? I’m with mrsblocko and really annoyed, too. No homemade treats at the schools. Grrr. I guess we’ll just keep stuffing all the kiddos with hydrogenated oily, high fructose junk. Love the carrier, cupcakes and Fuzz! I have one of these and they are awesome! I’m jealous that you can bring homemade goods to your daughter’s school. Everything at my daughter’s school has to be store bought. Where’s the fun in that? I have one. Unfortunately, I paid much more than that. *hmph*. I love it though. 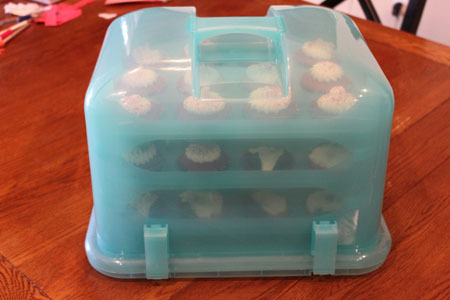 There’s truly nothing better for transporting a class’ worth of cupcakes. wow! Now I want to buy one. I already have so many baking supplies I feel a bit guilty. Beautiful cupcakes. 🙂 I love eating black bottom cupcakes.